Air Serv International, which provides air services to humanitarian organizations in Africa andAsia, has named one of its aircraft “Spirit of John Stott”. This is tribute to John Stott, the late Rector Emeritus of All Souls Langham Place,London, evangelical Christian leader, and author of many well known books, including Basic Christianity and The Cross of Christ. John was also the framer of the Lausanne Covenant and founder of the Langham Partnership that supports a number of initiatives for Christian leaders and pastors, particularly in Africa, Asia andLatin America. 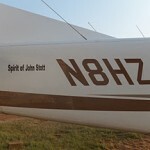 The aircraft which has been named “Spirit of John Stott” is a Cessna Caravan 208B. This aircraft can be used to transport up to 12 people, or cargo, up to approximately 1000 miles (1600 km) at about 200 miles per hour (320 km/h). It is able to land on “unimproved” air strips, and thus take people and supplies to places which are otherwise hard to reach, by either road or regular air services. It is fitting that such an airplane be so named, as John had a heart for the less fortunate, the “majority world”, and an interest in linking evangelism with social action in “balanced Christianity”. This airplane serves those who are less fortunate, in the majority world, and brings relief to those in need. 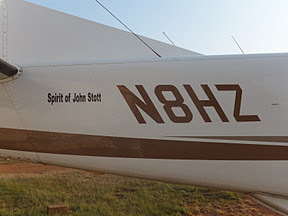 Currently, the “Spirit of John Stott” is based inEntebbe, Uganda. It is hoped that the naming of this aircraft will be a tribute and witness to a man who pointed people to Christ. You can read the whole story of John Stott’s life in my book “Inside Story: The Life of John Stott” (in America as “Basic Christian: The Inside Story of John Stott”) which is available from Amazon or “10ofthose”, the publishers IVP, or all good bookshops.